If you follow the MCU at all you'll be aware of the controversy surrounding this character. A certain subsection of fans are struggling with the idea that an entirely new, all powerful, character may fly in and save the day in the upcoming Avengers End Game film. An even smaller subsection of that group aren't happy it's a female character, seeing it as a forced, gender equality move by Marvel. A minority within those two groups have focused their ire on Brie Larson saying everything from she can't act to she's a flat out racist (against white males apparently). Then there's another subset of fans who see this as a movie to inspire girls and young women by representing strong female role models... which, I guess it does... as much as someone who can shoot lasers out of their arms is identifiable as someone to aspire to. 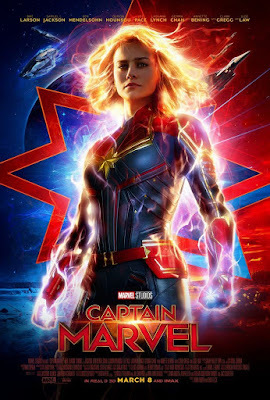 Regardless of where you fall on the opinion scale, before seeing Captain Marvel, I do feel this film delivers pretty much everything you'd want from a Marvel comic book movie. You'd have to be a real diehard against the film and everything you think it stands for to at least not have a good time. I thought Brie was well cast as Captain Marvel/Carol Danvers. Her performance fit with what the character is going through, and she was really credible as a force to be reckoned with once she goes full Captain. I did find Nick Fury's over indulgence in a certain cat to be a little jarring for the character but I guess younger Fury just really loves cats. Ben Mendelsohn and Jude Law both give fine performances as the main antagonists from their respective races though one is a little questionable in his tactics at the beginning of the film once you see where he ends up by the end. For me the only real let down was we didn't get enough of Clark Gregg as a younger Agent Coulson. I'm sure I'm not the only one who has missed his back and forth with Tony Stark, and his appreciation for Captain America. I just wanted to see him back in the big leagues i.e. the main MCU, but he really didn't get a lot to do here. Inevitably, as Marvel's first female lead superhero film, this movie will be compared to the first Wonder Woman movie. I think it holds up relatively well. Gal Gadot's Wonder Woman had the benefit of being a bigger 'name' character, and in my opinion, has the edge on getting a real heroic moment the audience can get behind, but I think Captain Marvel still comes in strong on her values and superhero abilities. Though the character is probably a little more cynical and world weary than Wonder Woman in her first film. Overall I enjoyed Captain Marvel. It definitely was a necessary film prior to Avengers End Game for the backstory on Fury's emergency pager call. For those people worried Captain Marvel is going to fly in and save the day for the Avengers this film won't do anything to make you think otherwise. In fact, it'll probably reinforce that fear, if it's something you'd rather not see happen. From my point of view it just adds to my anticipation for End Game. It'll be interesting to see how the surviving Avengers interact with someone that powerful, from Earth, that they've never heard of. And it'll be interesting to see how her powers will actually fit in with the events of End Game. It's not that obvious that she even has the ability to just fly in and save the day.